Tattoo Blog » Sympathy For The Devil. Tattoo Blog » Stories » Sympathy For The Devil. 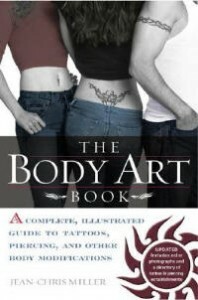 The Body Art Book : A Complete, Illustrated Guide to Tattoos, Piercings, and Other Body Modifications, Jean-Chris Miller, pg 56. No matter how you look at it the most popular tattoo images are from the dark side of human nature. From the hot naked red devil girl so popular in the fifties and sixties, to the durable, been around forever,skull and grim reaper imagery. Demon, dragon and devils have been a staple of the tattooing world for as long as anyone can remember. A fact that the “moral” religious right has been increasingly up in arms about since the popularity of tattooing has been on the rise. Never mind the fact that millions of us got to watch these bastions of “moral” behavior backstab each other during the Jim Baker fiasco of the 80’s, or that to make this country their own they lied, cheated, stole, and murdered. Oral Roberts threatened to die unless his “congregation” came up with millions of dollars to save his life. Despite all this, and far more than I have the space, or will to get into, we are the bad guys leading people into Hell with our Satanic ritual of tattooing. Excuse me for a moment while I roll around on the floor laughing. Over the course of many years I tattooed folks from all walks of life, especially when the art became more popular. Everyone from Bikers to Used Car Salesmen came through the doors of the various shops I worked in, and I’ve done images that ranged from Skull and dagger, to Jimmy Buffet tropical sunrises. During that time I learned a bit about people. It’s not the tattoo that makes someone good or evil, it’s the person. Plain and simple. A few interesting facts about the number of bodies that I put ink to. I did a tattoo for a pagan friend that was perhaps a classic as far as supposed “satanic imagery” would go. It was a pentacle with a horned skull in the center. Around the outside was a series of runic symbols at the points of the interlaced star. This guy was one of the kindest, gentlest, and most boy scout type of person you would ever want to meet. At one time he got semi-famous for saving a five year old from drowning, and the dude couldn’t even swim. He paddled out to her hanging onto an inflated inner tube. Another note worthy tattoo was done on a prosecuting attorney, young guy, stand up member of society, went to church every Sunday and on Wednesday revival. He got a small cross with a rose. He was known for going after drug dealers with a vengeance and seeking maximum penalties. He was later arrested as the leader of the ring that was importing the cocaine being sold in the first place. The point is that the tattooing choices people make have little to nothing to do with whether or not they are satanic in nature. It is the person themselves that is in question. Sure there are more than a few bad asses who wear tattoos. I also know there are more than a few good people out there who love them too. I’d be more than willing to bet that the good people out number the bad one’s by quite a large margin. As tattoo collectors we show the world what we like. We make a statement that more often than not proves the old saw; “You can not judge a book by it’s cover.” If getting a tattoo is a sure sign of going to Hell. I guess I’ll meet you all over by the bar-b-q. Seems more often than not you’ll be spending time with a better class of people. Maybe I can talk Paul Booth into doing my next dragon while we’re there?